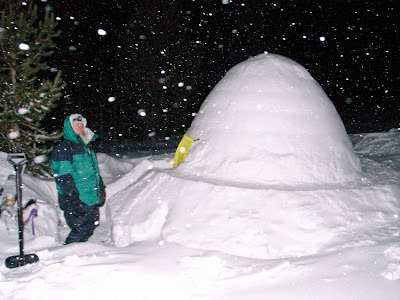 The February issue of TGO magazine, out now, has a feature on my Yellowstone ski tour with Igloo Ed last winter – see blog posts for February and March 15 2007 – on which I lived in igloos built with the IceBox tool. This winter I am undertaking another ski tour in Yellowstone, again with Igloo Ed along with some others. I’ll report on how it went in a couple of months. The photo shows Ed outside the igloo in Little Firehole Meadows during an evening snowstorm. Photo info: Ricoh GR-D, f2.4@1/30, flash on, ISO 400, raw file converted to JPEG and processed in DxO Optics Pro. I have seen quite a number of posts about this tool - does it work well? Sometimes I find it easier just to make a pile of snow and hollow it out. Yes, it works well. I've hollowed out piles of snow quite a few times - I used to teach snow shelter building when I worked as a ski tour leader - and building igloos with the IceBox is easier. There's no need to check the thickness of the walls as the form determines this, as it does the size of the igloo. Using the IceBox is also much drier as you don't come into contact with the snow.